You do not even knows ... Dark Lords are Dark Lords ... in many cases you applaud them ... honor them ... they are the Stars ... but indeed they have provoked the Fall of the Truth ... they NOTHING knows about EDEN. EDEN Word comes from ... DivinE WisDOM ... or EDOM ... Here again like always happens ... some steal ... Light, names ... everything. What you are ORLANDO? ... Well ... we have this ORLANDO ... We will take him ... not You. We will kill thousand of Homosexuals in ORLANDO, in Florida and remove you from the scene ... We do not care about you or ORLANDO, nor Homosexuals ... Important is you are Out of the Scene. What are You? ... Venezuelan? ... Well ... we will destroy your Country ... 100% ... still we in Power will go so far to try to destroy you where you are ... For us is simple ... "Business" to destroy Countries and Cultures. What do you do? ... Books ... Well ... We will block ALL YOUR BOOKS ... So you have nothing ... exactly NOTHING ... Not one cent. This is NOT Eden ... No. Avatar is the name of ... Great Walkers and Lords ... Lord Jesus was an Avatar ... Maitreya, who was the Buddha, Krishna and you can listen both Krishna and Buddha ... in their Times and they have a different Time in the Universe. But let us talk on ... EDEN. Nature has a "Night Side" ... hidden and Mysterious ... and you need to be ... "Lunar" ... and live with the Moon ... measuring the Time with the Moon to be Logical and Calm ... as well ... "Silent" ... but Shine ... like the Sun ... be ... Logical means to applaud ... "Life" ... in others. Welcome to the heart of Maitreya. Welcome to Maitreya’s Mystery School. The Ascended Master whose name means kindness is present with us today. He is here at his Mystery School fulfilling his vow to tutor souls on earth who desire to walk the path of becoming the Bodhisattva. He who wore the mantle of the Lord God in the Lemurian Mystery School called Eden has come in answer to the call of the Divine Mother to save the Lightbearers. As a backdrop to our understanding of the person of Buddha Maitreya in his individualization of the God Flame, I shall continue my presentation of the many faces of Maitreya that emerge out of the East. I have said that Maitreya is unique in Buddhism because he is the only other figure besides Gautama Buddha who is universally accepted in all Buddhist traditions. He holds a prominent place among all of the Bodhisattvas as the one who is destined to be the next Buddha. Because of his future role, Buddhist writings and works of art sometimes portray Maitreya as a Buddha. Unlike other Buddhas and Bodhisattvas who are shown sitting in the lotus posture, Maitreya is often represented standing or seated with his legs uncrossed, indicating his readiness to descend to earth. But like other Bodhisattvas, Maitreya is typically clad in princely garments and bedecked with jewels, which symbolize the Bodhisattvas’ spiritual sovereignty as heirs of the Buddha and the rewards they will one day earn when they will have attained Buddhahood. This evocative statue represents a slender, youthful being seated in a pensive attitude with the fingers of his right hand supporting his head and his bent right leg resting across the left knee....The remarkable grace and pliancy of its pose make this a penetrating evocation of a being in a state of profound intro­spection....In China where, this iconographic type was popular between the fifth and eighth centuries, the meditating pose symbolizes a turning point in the spiritual career of both Prince Siddhartha and Prince Ajita [Maitreya]—usually the moment immediately preceding enlightenment. A precious life-size statue of a crowned Buddha, a gift of students of the Buddha and the Mother, has graced our home and altar for many a year. Draped in golden robes trimmed in ruby, he is seated in a lotus posture, hands in the anjali, or namaskara, mudra with palms and fingers together at the level of the chest in the gesture of supplication or reverence. Art connoisseurs who have examined the statue have said that it may be a representation of a Bodhisattva rather than a Buddha because Buddhas are not usually presented with a crown. But I can see in this Buddha at once the sweetness of our beloved Gautama and the kindness of Maitreya, the crowned Bodhisattva become Buddha. We have always thought of this statue as a portrayal of Gautama Buddha, however. And for us the crown is apropos because we acknowledge that Lord Gautama Buddha was crowned Lord of the World on January 1, 1956. In like manner we proclaim Maitreya as the Coming Buddha who has come, as he did assume on the same day the offices of Cosmic Christ and Planetary Buddha vacated by Gautama. So whether you choose to see in this statue the face of Gautama or Maitreya, of Buddha or Bodhisattva smiling through, you may happily find the oneness of the Guru and the Chela. Maitri is one of the four brahma-viharas, or sublime states of mind, literally “Brahma-like, godlike or divine abodes.” The other three brahma-viharas are karuna (compassion), mudita (limitless joy) and upeksha (equanimity). The diffused rays of maitri can be visualized coming from the heart chakra and from the threefold flame, which is sealed in the Eighth Ray chakra, the secret chamber of the heart. Call to your Holy Christ Self and to your Mighty I AM Presence to send forth powerful needlelike rays of Divine Love and Wisdom that reach all sentient life. True loving-kindness is indeed the perfect balance of Love/Wisdom crowned with Power, expressed as loving care toward the evolutions of God. My emphasis as I tutor your souls is in the development of the heart as a fiery furnace, [a] vortex of transmutation, and a place where the threefold flame is balanced, [out of which] one can extend the borders of being and love to enfold so many who suffer. Think upon these words of the Bodhisattva vow: fearless compassion! Ah, what a state of mind to be in perpetually! Fearless­ness to give of the fount of one’s being, to extend compassion instead of criticism and backbiting, to give such flood tides of love as to fill in the chinks and cracks of another’s shortcomings. I will tell you what has impelled us to reach beyond our ability, and I speak of all the ascended hosts. It is because we saw a need so great and had such compassion for the one who had that need, and [we] saw that none other stood by to help that one, none other would come if we did not extend the hand. In that moment, beloved, Love itself supplied the intensity, the [sacred] fire whereby we could leap to the rescue, to the side of [one in distress], or enter some course of study [so] that we might become proficient in [the] knowledge that was needed. This “active compassion” of the Bodhisattva, embracing both fearless­ness and virya, finds its ultimate expression as forgiveness. It is impossible to extend compassion to someone if you have not first forgiven him for his transgressions. And in order to be charitable or forgiving, you need virya. If you don’t have strength, you have nothing to give—you don’t even have the energy to forgive. It takes strength to fulfill your own needs and then have something left over to give to others. We urge, then, upon all an understanding of the ritual of the heart. When an individual does some bit of harm to you, precious ones, whether it be mischievous or intentional, you who are the wise ones will immediately seize upon the opportunity to forgive him. For when the essence of forgiveness is released from your heart, not only does it create a passion for freedom in the erring one but it intensifies remorse in his heart, thereby bringing him to the feet of his own divinity. Thus he is able once again to laugh at the wind and the wave and the seasons and the buffetings of life and understand that all is a chastening to unfold his soul’s reality. Do you see, then, gracious ones, that courtesy as an expression of forgiveness and affection between hearts is a spiritual activity that brings about great soul expansion, which is intended to bring every man from serfdom to a state of lordship where he is the master of his world? Yet we sometimes look askance, even from our octave, at those individuals who have long been under our tutelage and our radiation who upon receipt of some trivial offense immediately begin to send out a vibration of great resentment against the one who performs this offense against their lifestreams. Quite frequently there is a mounting of intense reactionary resentment; this creates a great karma for the student of Ascended Master law, who ought to know better. And through the rupture that is thereby created in the emotional body, there is a pressing in from the sinister force of disturbing vibrations that not only flow through the aura and lifestream of the one who has taken offense but also puncture the peace and harmony of the supposed offender. Do you not see, then, by contrast what a gracious thing the ritual of forgiveness can be? And O how wonderful it would be if our students would truly understand the law of forgiveness! It is a sweet gift from the heart of God and one that people ought to welcome into their worlds so that they may freely give it to others, even as they have freely received it. Let us, then, seek not after lust or luster but let us seek after the perfectionment of life. The perfectionment of life lives within you. It is quite natural to draw light from within your heart and send it out into the world. This is the virtue that creates the seamless garment. Do you realize that your tube of light is the seamless garment of the Christ? Do you realize when you call forth from God the perfection of his light-radiance to surround you that you are weaving the seamless garment around yourself? Precious ones, I want you all to understand tonight that the moment that you have in your thought and feeling world resentment against any individual or any group of individuals on earth, you are immediately sending forth through the qualification of your energy the substance which will create a boomerang that will bring to your doorstep a great deal of unhappiness. You do not wish to reap the fruit of unhappiness, do you? Then I am certain you will understand that even if you do not always feel like forgiving, it is that discretion which is the better part, in fact the best part, of valor. I will not leave thee, O my God! I will tend that fire. I will adore that flame. My heart leaped for joy. My Father had given to me the challenge to know Love, to be Love, not for the sake of mere love and loving Love, not for the sake of the mere bliss of the communion of Love, but for the salvation of souls, for the reaching out unto my God in humanity. One tender smile is surely worth a thousand frames <15> of the face of Maitreya. The loving, overflowing, pure heart’s giving—does this not convey the Maitreya beyond the veil? I desire you to be myself, not in pomposity or pride (now self-styled initiators of lesser mortals), nay, but to remember that by the grace of the one who has sent me you yourself might be my vessel. You shall surely know the Buddha in the way when you expand the golden pink glow-ray of the heart, becoming thereby tender, sensitive, loving in a beautiful sound of Love—love as appreciation for the soul, for the spirit, for the vastness of potential and being, but above all [love as] appreciation for the God Flame. In gratitude for the God Flame that is your threefold flame, serve to set life free. Kindness always comes forth from gratitude. Selfishness emits from the state of the ingrate who receives again and again and demands more and demands more again as though Life and Hierarchy and Mother should supply all wants and needs. Blessed ones, to forget to be grateful for the gift of the flame of Life means that you can be capable of riding roughshod over another’s tenderest moments and feelings in this insensitivity. In profound gratitude for the gift of the flame of Life whereby we extend kindness, fearless compassion and virya to all life, let us offer “The Keeper’s Daily Prayer” to the Buddhas and Bodhisattvas who have carved the Path before us. While Maitreya is accepted by all Buddhists, he does take on a variety of roles in different cultures and religious sects, some of which I told you about in my introduction to Book I. These roles include the guardian and restorer of the Dharma; intercessor and protector; a guru who personally communes with, initiates and teaches his devotees; a messiah who descends when the world is in turmoil; a messenger sent by the Divine Mother to rescue her children; and the Zen Laughing Buddha. Maitreya’s role as an imminent Buddhist saviour originated with certain Chinese Buddhist sects that, contrary to traditional Buddhist sources, believed that his coming was to be in the very near future. Traditional sources have maintained that Maitreya is destined to come as far into the future as 5.67 billion years after Gautama’s parinirvana, when the earth will have already evolved into a utopia. The calculations for this period were based on very lengthy definitions of the cycles of time. But Chinese Buddhist sects in the late third to sixth centuries used radically shorter definitions of these cycles, bringing Maitreya’s coming close to their own lifetime. These sects believed that they were living in a period called mofa, a dark and destructive time similar to the Hindu Kali Yuga that must pass before a new era can begin, and that Maitreya would come to judge the wicked and save the righteous from the evils taking place. When Maitreya descends, the demon-kings with their armies will try to resist him, and they are defeated by a host of myriads of bodhisattvas, riding on supernatural elephants and lions, and armed to the teeth. ‘the father will not know his son, nor will the mother know her daughter.’ The crowds of sinners and of the pious ones seem to be herded into two separate groups;...when Maitreya descends he will collect those who are destined to be saved ‘east of the bridge,’ and the sinners ‘west of the bridge.’ The chosen people constitute a small minority....Their salvation is the fruit of their religious piety, which [includes]: the confession of the Triple Refuge [the Buddha, the Dharma and the Sangha]; the Five Rules to be observed by laymen [prohibiting killing, stealing, adultery, lying and intoxication]; fasting, the practice of ‘visualization’, and reciting the Guanshiyin Scripture [the Kuan Yin Scripture]. Maitreya appears again as a messiah in the teachings of the White Lotus sects of Buddhism. The White Lotus religion began in the twelfth century in China and continued as a strong movement until the early nineteenth century. It was the most powerful and long-lived spiritual movement in the history of Chinese Buddhism. In general its adherents were devoted to piety, the restraint of the passions, and vegetarianism. They sought to popularize Buddhism beyond the monastery and wrote scriptures and ritual texts in their own vernacular. Although some White Lotus groups did become involved in violent political activities, such as the overthrow of the Mongolian rule in the fourteenth century, by and large they were sincere and peaceful. By the sixteenth century, these sects focused on a new element of religious belief, the worship of the Eternal Venerable Mother. They believed she would send Maitreya as a messenger and saviour to rescue her children whom she had sent to live on earth. Believers formed small congregations bound by strands of teacher-to-pupil ties, and met to worship and to read [their] scriptures together. Some, inspired by their patriarch’s predictions that the end of the present cosmic era would be signaled by great catastrophes and by the appearance of a savior sent by the Eternal Mother, rose in rebellion in order to usher in the new world. Although outlawed...for their beliefs, deemed incompatible with official orthodoxy and conducive to violent political action, communities of White Lotus adherents survived and grew in subsequent centuries. The White Lotus religion taught that the children of the Eternal Mother were all “Buddhas and immortals” (Sanat Kumara’s 144,000) but that during their sojourn on earth they became caught up in desires and sensual pleasures, forgot their true identity, and became immersed in the (astral) “sea of suffering,” or samsara, <19> with its endless rounds of rebirth. White Lotus devotees believed that in each of three great periods of history (called kalpas) one of these Buddhas would appear. The three Buddhas would each be responsible for disseminating a certain teaching particular to his age. This scripture provides vignettes that portray Maitreya exhorting and converting people in his various guises. Maitreya appears as a Confucian physician carrying an elixir of youth and healing all illnesses with one dose. He appears as a ragged scholar who preaches to drunkards, prostitutes, selfish monks and unscrupulous businessmen. Gautama teaches in The Sutra of Assembled Treasures that the Dharma boat is the means that a Bodhisattva employs “to rescue those sentient beings who are drifting and drowning in the vast stream of samsara.” As we learn from this sutra, Gautama instructed his Bodhisattvas that in order to succeed in their rescue mission to save not only the souls of others but their own souls, they must quickly embody the fullness of the Dharma and themselves become the Dharma boat. The Buddha said, “Universal Light, a Bodhisattva who wishes to cultivate the Buddha-Dharma should exert himself twice as hard. Why? Because the body is impermanent and uncertain, a decaying form which cannot long remain and will eventually wear out and perish; it may disintegrate before one benefits from the Dharma. I come that you might hear my voice and know that all of my offering on the path of the Buddha is in the love/reverence of the Mother and the Mother’s burden to reclaim her own—to find them again, to wash them clean, to make them whole, to heal their bodies and therefore to prepare food for soul and body and mind. Thus he gives us the key to the inner meaning of his name. Maitreya: Ma—the universal sound intoning the Mother Flame; I—the I or Eye signifying the Identity of the Guru as the indivi­dualization of the Mother Flame; T—the sign of the cross signifying the path of initiation of each disciple of the Cosmic Christ; Rey—the ray of the Mother’s Light manifesting in you; A—as you are the seed of Alpha (the alpha particle). We know from our study of Gnostic scriptures that White Lotus beliefs closely parallel the teachings of the Christian Gnostics, who believed that divine messengers or redeemers had been sent from the realms of Light to tell the children of the Light that they are not natives of this world and to call Home those on earth who had the “seed of Light,” or the divine “spark,” but were ignorant of their divine origin. In the beautiful Gnostic poem “The Hymn of the Pearl” we find a great parallel to the White Lotus portrayal of the Eternal Mother’s call to her children to return Home. This poem is contained in the Acts of Thomas. It describes the sojourn of a prince who was sent forth by his parents to Egypt to capture “the Pearl that lies in the Sea...by the loud-breathing Serpent.” His parents promise him heirship in the kingdom when he accomplishes this mission. But the prince, partaking of the food of the Egyptians, enters into the sin of forgetfulness and its consequent karmic state of nonawareness. He forgets that he is a king’s son, forgets his assignment, and sinks into a deep sleep. The prince lulls the serpent to sleep by chanting over him the names of the king, the queen and his brother, whereupon he rescues the Pearl, returns to his Father’s kingdom and receives his reward. “The Hymn of the Pearl” is a story that takes place through a number of incarnations of the soul, who, having descended from the etheric octave, loses the memory of his origin and mission and merges with the realm of sleep. Answering the call of his Divine Parents, he emerges as the awakened one, redeems himself and his soul, becomes the saviour of his brothers and sisters who have met the same fate in “Egypt,” finally returns to his Home of Light and fulfills the ritual of the ascension. Awake, I say! For I AM Himalaya. And I have attended your comings and your goings in and out of incarnation unto your Causal Body, unto the farthest depths of the astral and physical planes. I say to you, beloved, according to the path of initiation outlined in “The Hymn of the Pearl” (that is truly based upon an ancient Lemurian text known by Jesus), your [soul’s] evolutionary spiral has continued too long in and out of earth consciousness. I will be saved and I will save. Amen. Thus we glean from Gnostic works that Jesus came under the Law and that he, too, walked a path of overcoming, just as we learn from Buddhist writings that Maitreya and all the Bodhisattvas and Buddhas had to walk a carefully outlined path of initiation to gain their goal of enlightenment. Up until some twelve thousand years ago, Jesus had had previous incarnations on the continents of Lemuria and Atlantis. In one embodiment he ruled Atlantis during an age of great enlightenment when more than 50 percent of the population were fully clothed in their Christhood. In the Genesis account of Adam and Eve, Jesus was righteous Abel, a keeper of sheep, whose offering was accepted by the Lord. But when Cain, a tiller of the ground, brought his offering and the Lord did not respect it, he rose up in anger and slew his brother Abel. Thus, through the rebirth and the renewal of the spiritual seed of Christ in Seth, the sons and daughters of God once again had access to the Mighty I AM Presence by means of his mediatorship. And outside of Eden the Guru-chela relationship was carried forward through the centuries by those who sustained the devotional tie to the Lord God Maitreya by obedient and enlightened love. This Seth was the reincarnated Abel—our Christ Jesus come again to insure the Christic lineage of the Guru Maitreya in the descendants of Adam and Eve. More recently we see our Lord in the Old Testament as Joseph (c. 16th century b.c. ), the favored of the twelve sons of Jacob, remembered for his coat of many colors, by which he became the envy of the rest. Though persecuted and sold into slavery by his brothers, Joseph became the pharaoh’s governor and saved his family and all of Egypt during seven years of famine. Jesus was also embodied as Joshua (c. 1300 b.c. ), the successor of Moses and great warrior (in the tradition of Sanat Kumara <43>) who led the Hebrews into the promised land. He was David (c. 1010-970 b.c. ), the king who united the Israelites into one nation and the psalmist whose heart’s communion with the Lord deeply touches our own. Jesus came into his final incarnation having passed many initiations throughout his Eastern and Western embodiments; yet he retained the small percentage of karma that was required for his mission, which he balanced by the time he left Palestine at age thirty-three. It is the teaching of the Ascended Masters that so long as an initiate is unascended, no matter what his level of attainment, he is subject to the law of karma and must submit to the path of initiation under the lineage of the Buddhas and the Christed ones of the Great White Brotherhood who are his sponsors. Even as the redeemer must be redeemed and the saviour must be saved, so the one who would be Guru must first be chela. John the Baptist in turn bowed to the Light of the Word in Jesus and said, “He must increase, but I must decrease.” <50>By this, John affirmed the law that when the chela is ready to assume the mantle of his Guru, the Guru withdraws to higher octaves. Thus, on earth John the Baptist’s mission and mantle would henceforth decrease proportionately as Jesus’ mission and mantle would now increase under Lord Maitreya. Maitreya was the Guru of both Elijah and Elisha, both John the Baptist and Jesus Christ. However, Elijah preceded Elisha in the order of hierarchy, and this precious relationship was retained by John and Jesus from childhood on, even though Jesus was the one chosen to be the Avatar of the Piscean Age and John was chosen to ascend before him to hold the balance for his mission from octaves of Light. Buddhist teachings reveal that Gautama and Maitreya also were required to fulfill the whole law. They, too, had previous embodiments in which they had to overcome shortcomings as they walked the path of initiation before earning their Buddhahood. There are hundreds of stories, called jatakas, about the incarnations of Gautama and his disciples that describe how they fulfilled or fell short of fulfilling the requirements for Bodhisattvahood leading to Buddhahood, at times even sacrificing their own lives to save others. You may read these stories that I told so long ago. They are in the collected writings of the Buddha that are published even today. They must be read symboli­cally. They must be read with understanding and above all with the Ascended Masters’ teachings as a basis. In aeons long past, aeons beyond recall, there was an emperor in this world by the name of Mahayana who had a thousand kings subject to him. He had three sons: the eldest, Mahanada, the middle son Maha-deva, and the youngest, Mahasattva. From childhood the youngest son was of a loving and compassionate nature and thought of all beings as his only sons. In contrast to this story in which Maitreya was not yet willing to sacrifice his life, another jataka relates how Maitreya did just that in an embodiment as the powerful emperor Sankha. In this tale Maitreya gives up his kingdom, “impelled by the joy of contemplating the Buddha,” in order to go alone on foot in search of the perfect Buddha Sirimata. During the first day of [Sankha’s] journey on foot, the soles of his feet split open, for they were tender due to luxurious upbringing. On the second day they began to bleed; on the third day he was unable to walk any further. Then he went on his knees using the palms of his hands as support. Going on the fourth day in the same manner his knees and palms bled, at which the Emperor Sankha thought: “I should go on my chest,” so he began creeping on his chest. Impelled by the joy of contemplating the Buddha, even though (sorely) afflicted he surmounted the great suffering and pain. The jataka goes on to explain that by this offering Maitreya fulfilled one of the requirements on the path of the Bodhisattva known as the perfection of giving and was reborn in the Tushita heaven as a deity. Maitreya teaches that what one man has attained all men may attain. In other words, the Great Law is no respecter of persons. <56> All pure sons of God have a threefold flame, through which they may create their creations out of the flame of the Father, through which they may preserve their creations out of the flame of the Son, and through which they may seal and thereby make permanent or destroy (i.e., transmute) their creations out of the flame of the Holy Spirit. And that is our daily freewill choice. The words “It is time to make your decision to fulfill your destiny, for I have come!” are a clarion call from the Great Central Sun to all souls of Light to “Come Home!” Our Father and Mother have watched and waited as the earthly seasons have passed round and round, along with the almost hypnotic reincarnation of the soul again and again under semifavorable conditions of personal and planetary karma, while we have postponed the decision of our destiny. Even on the Path, and perhaps especially on the Path, people are in an almost half-awakened state. They feel secure that they have found their teacher, found their mantra, found a means to improve their abilities. Some who have never truly embraced the disciplines of the Path use unlawful techniques for the control of self or others, such as playing cassette tapes with subliminal messages that are not audible or comprehensible, thereby programming the mind to this and that by what amounts to autohypnosis. These techniques are used to achieve the inordinate desire of self-mastery for personal gain by persons who are unwilling to bend the knee before the Law, the Teaching or the Guru. All kinds of techniques are packaged and offered for those who want to bypass their karma and be popular, healthy, wealthy or whatever. You can even join an Eastern cult that says if you give such-and-such mantra you can get anything you want in this world! So when people find these techniques of a pseudoreligious nature, they believe they have somehow beaten the game of ordinary mortals, who must suffer this and that element of their psychology or karma—until the karma for their karma-dodging descends, that is. Thus, by taking whatever detour suits their fancy, people procrastinate their reunion with God on the path of individual Christ Self-mastery. But what they are really doing is postponing the day of decision to fulfill their destiny. And what destiny is it? It is our fiery destiny. It is our soul’s ascent to the Mighty I AM Presence. It is the conscious engaging of our minds and hearts in the mighty work of the ages—the balancing of our karma and the slaying of the dweller-on-the-thres­hold. <58>It is our soul fully awakened and multiplying the Word and Work of the Lord wherever we are. It is the conscious entering into the Path, and our willingness to sacrifice and surrender on a path of selfless service, our willingness to experience the pain and the bliss of all levels of our reality and our unreality as the Lord God does ordain it. Think of it. Here is the Father-Mother God, Alpha and Omega, who could have said anything to us on this momentous occasion of their address, saying with the full power of their presence, “It is time to make your decision to fulfill your destiny, for I have come,” as if we needed to be reminded that we have not decided to fulfill our destiny. We are the Keepers of the Flame gathered in the Heart of the Inner Retreat, certainly not unaware of our fiery destiny, certainly believing in our hearts that we have made that decision. What Alpha is telling us is that we have not qualitatively made a decision that has a sufficiency of desire, one-pointedness, determination, resolve and fearless compassion to be counted as a decision. Our decision is not counted as a decision until we are fully engaged with all of our forces, human and divine. And we are not fully engaged until we decide 100 percent that we want to slay that dweller-on-the-threshold of the not-self, i.e., the synthetic self of our human creation. We can’t want heaven when we still want to keep a piece of the pie of the karmic self. We have to want to have that dweller bound hand and foot and in chains and encaged in that lower level of being. And the proof of our wanting to do something is that we do it! We simply set everything else aside and we do it. So in making the decision to fulfill our destiny we must take the time to sit down and examine our desires one by one. Examine your goals. What do you want out of life? Ask yourself the question and then answer it. Then take note whether or not your desires and the energy it takes to fulfill them are taking up an inordinate amount of your lifestream. If so, your decision to fulfill your destiny is worth nothing because you haven’t made the decision to free up enough energy out of your subconscious and out of the daily allotment of energy God gives you to fulfill that destiny. You’re taking up too much of the energy God has given you to preserve the old self with its wants and its whims, and there just isn’t enough left over to fulfill your destiny day after day. It’s like the space shuttle taking off. It takes a tremendous amount of energy to launch; and so it is with the soul. We have to summon all of our forces to act on the decision we have made to fulfill our destiny now. You must look at the warring in your members <59> and decide this day, in the name of Alpha and Omega, that you will become the Buddha by the shortest route and not the longest. Because short and long are conditions of time and space, and there’s no guarantee as to what the condition of our time and space will be in the days, weeks, months and years ahead. So Jesus said, and Maitreya said through him, “Walk while ye have the Light.” <60>The real meaning of this is: Work on your karmic potential while you have the Light incarnate with you in the person of the living Guru. Work while you have the dispensations of the Great White Brotherhood and the Ascended Masters as your sponsors. Work while you have the gift of the violet flame and the dynamic decrees and the protection of Archangel Michael and the hosts of the Lord. Work while you have the Lost Teachings of Jesus Christ, Lord Maitreya, Gautama Buddha and Sanat Kumara in hand, that you may become an initiate of the Inner Christ and the Inner Buddha. Give it your very best, and when you want to come back to this plane, for God’s sake, come back as an unascended master and not as a karma-bound fool! Another portrait of Maitreya, which took shape in China in the tenth century, is that of the plump, jolly, pot-bellied Laughing Buddha who is known as the Hemp-bag Bonze. A “bonze” is a Buddhist monk. This endearing figure is often depicted sitting and holding a sack, with happy children climbing all over him. Some Buddhists say that the children Maitreya is playing with represent arhats (adepts, perfected saints). Statues of the Laughing Buddha can be found in most temples in Taiwan and have made a comeback in mainland China. He is usually the first image one sees inside Chinese Buddhist temples, his smiling visage greeting all who enter. Tour guides in China explain that Maitreya manifests in this unhandsome form so that people will concentrate on his teaching rather than upon the beauty of his being as portrayed in earlier Buddhist art. When he was seen wearing wet sandals and scurrying for shelter, rain was expected; but when he slept on the market bridge in a squatting posture, his head resting on his knees, then good weather was expected. One feature of his appearance singled him out—he carried a hemp bag wherever he went. Into this bag was deposited whatever he received, and for this reason the bag became an object of intense curiosity, especially among the children. They would chase him and climb all over him, and force him to open his bag. On such an occasion he would place the bag on the ground, empty the contents one by one, and just as methodically put them back into the bag. The expressions attributed to him were all enigmatic and exhibit [Zen] characteristics....Once a monk asked him about his bag; he replied by placing it on the ground. When asked what this meant, he shouldered the bag and went away. Once he was asked how old the bag was, and he replied that it was as old as space. things under Heaven which are difficult to contain. Now I would like to take up the teachings on Maitreya given to us by the Ascended Masters in this century. In this mystery of Maitreya we understand that in order to experience the Era of Maitreya we must have the conviction that it is at hand. We must have the conviction that as we are one with our Holy Christ Self, so we are one with Maitreya, who as the Universal Christ is personified in our Holy Christ Self. Our life must be purified by the flame of achievement, achievement through the Holy Christ Self and the Holy Christ Flame. Then we will have the conviction of the Era of Maitreya. We will experience that Era as we contain it, even as we experience the kingdom of God as we contain it. Come now, come now, be joyous in that buoyant flame. For I AM Maitreya and I AM happiness—a Buddha of happiness, a chela of happiness, a friend of happiness. All these thousands of years they have called me the Coming Buddha, and I have been coming and coming and coming, and at last I AM here! I AM come! I AM the Buddha of the Aquarian cycle. Perceive, then, the coming of the Mother always as the sign of Lord Maitreya. For we have a saying: If the Mother be in our midst, can Maitreya be far behind?Far nearer than the far-off worlds is the emanating Light of Maitreya. Messengers of Maitreya are we, one and all, sent to bear his Teaching, the same Teaching that has been taught by Jesus Christ and Gautama Buddha. It is the Teaching of the Divine Mother. We teach it best by embodying it and by our example, and then by explaining that example and how others can be it too. As I told you in Introduction I, on May 31, 1984, Jesus announced the dedication of the Heart of the Inner Retreat and the entire property of the Royal Teton Ranch, our international head­quarters in southwestern Montana, as Maitreya’s Mystery School. <71> The Mystery School of Eden, located on Lemuria near where San Diego is today, was the first Mystery School on planet earth. And Maitreya, referred to as the Lord God in Genesis, was its first hierarch. On April 6, 1985, Justinius urged chelas of the Word Incarnate to consider the significance of the coming of Lord Maitreya and the reestablishment of his Mystery School today. My beloved, I welcome you as I welcomed to my heart long ago the youth Issa, your Jesus, when he came to the Himalayas and touched the fire of Tibet and knew the ancient lamas and found me. <73>For I was the one promised and known of him even before birth, as the entire drama of the mission of the avatar of the Piscean age was, of course, premeditated by God and directed from above. Sweet Jesus, the strong, when he said to his parents at the age of twelve, “Wist ye not that I must be about my Father’s business?” <74>he spake of the Teacher, the eternal Guru he must go and find. [He must] go to the East and, as all such saints, receive the anointing from the lineage of his descent. Thus, the mission of Jesus was to go back to Eden, yet the Motherland was long gone. [Therefore he came to Shamballa.] And he came to the ancient repository of the tablets of Mu and the writings of Maitreya and Gautama and Sanat Kumara. He came for the redemption of those who had been turned aside [from the law of the Divine Mother] and to restore [to them] the [true] path of discipleship [under the Cosmic Christ]. My beloved, with what great joy I receive you here as I received the youth Jesus! For the dispensation is truly opened and I may begin anew, taking those who have apprenticed themselves before the Darjeeling Master and Saint Germain and the Great Divine Director, those who have disciplined themselves by the Law of Love before the living Christ. Indeed, indeed, you must acknowledge him the Saviour of your life, for he is! He restored to you the contact with your own Christ Self and [he] is here today to increase that spark or even ignite it again if, by your words and your works, you may be rotated one hundred and eighty degrees to face the living Son of God. If you cannot see the Saviour in him, I cannot teach you; there is nothing else. He has taught my teaching. I would take you from [that level] and beyond. You can never save so much as a bumblebee if you do not see the glory of that life....For he was and is God incarnate, truly in the unique sense that God raised him up as the example but never in the exclusive sense that all could not follow in his footsteps. Therefore be ready, for thou shalt meet Maitreya in the way one of these days. Accept, then, the invitation to be trained at the retreats of the Lords of the Seven Rays, <76> for they do prepare your souls for the Great Initiator. Maitreya is that one. And I come that you might have the aura of the Holy Spirit to receive him again. For many of you he was the last initiator from divine realms that you have seen. [You saw him] in the Mystery School known as Eden, upon Lemuria, not far from this place. Maitreya has come. He has set up the Mystery School, choosing the Royal Teton Ranch as the place for that Light. He has come to call ancient souls, twin flames, back to where they left off [in their] initiations on the continent of Lemuria. Here was the Mystery School. Here was the opportunity. Here it is born again. Gautama taught his disciples to take refuge in the Three Jewels—the Buddha, the Dharma and the Sangha. Maitreya’s Mystery School is the jewel in the heart of our Community of the Holy Spirit, the Sangha of the Buddha come again. Indeed, this Sangha is the cradle of the Buddha and the Dharma. This is why the Ascended Masters have sponsored our Community of the Holy Spirit at the Royal Teton Ranch. Here chelas of the Word Incarnate study and put into practice the mysteries of the Universal Christ delivered to us by Sanat Kumara, Gautama Buddha, Lord Maitreya, Jesus Christ, by the Buddha Padma Sambhava, the initiator of our twin flames in the lineage of the Ruby-Ray Buddhas, and by all of the Ascended Masters. Here souls who have heard the call of Saint Germain and El Morya dedicate themselves in the Guru-chela relation­ship to the unfoldment of the inner potential of the Christ, the Buddha and the Mother Flame unto the goal of the ascension through the disciplines of the path of the Bodhisattva. ...By the Light of devotion of the Lord of the World, the Saviouress is come unto the West—long pro­phesied—out of the West Wind. And in the very heart of her children’s longing—the very heart of her children’s longing, I say—does she come forth in this hour. And leading the children who greet the Mother is Maitreya, bearer of the banner of the World Mother. From Shamballa I arc a Light. I would establish the ground of the Ancient of Days. I dedicate, therefore, this Inner Retreat as the Place of Great Encounters where each one might come to encounter the Lord God Almighty, his own I AM Presence, Sanat Kumara, Gautama Buddha, Lord Maitreya, and the Lord Jesus Christ. Blessed hearts, souls encountering Truth, souls uniting one with the other, forging a union, forging a nucleus, forging a magnet for transition into the New Age: when have we ever seen re-created [the Community of] the original seed of Sanat Kumara gathered together in one place, not merely for human companionship but for the understanding of the components of the capstone and the components of the heart of America? [When have we ever seen them] understanding the rising of the soul, disengaging from the dissonance of the world, from its momentum of war and bloodshed, oppression, and the clouding of the mind by tyrants? When have we ever seen gathered together, in the numberless numbers of thousands, the Body of Light [the Sangha of the Buddha] of planet earth? ...By the Spiritual Community—the Order—we mean a group...of truly human individuals who have Enlightenment, the Path, and the Spiritual Community itself as their ideals or who, in traditional Buddhist language, Go for Refuge to the Buddha, the Dharma, and the Sangha. Of this Spiritual Community the Bodhisattva is the spirit, even as the Spiritual Community is the expression, at least to some extent, of the Bodhisattva principle in the world. It is the Bodhisattva who, from the Beyond which is within, as well as from the Beyond which is without, leads the Spiritual Community on the Path to Enlightenment. The Bodhisattva always has led and always will lead. We see him in the jatakas as the hero, the being who represents the point of self-trans­cendence within each group or class of beings. We see him always taking the lead. In some of the great Mahayana sutras we see him establishing what is known as the Pure Land, or ideal environment for the pursuit of the spiritual life. We see him as Avalokiteshvara, Lord of Compassion, whose eleven faces look down upon the sufferings of sentient beings in the eleven directions of space, and whose thousand arms are out­stretched to help. We see him as Manjushri, Lord of Wisdom and Eloquence, who with his right hand whirls above his head the flaming sword of knowledge, that cuts asunder the bonds of ignorance, while with his left he presses the book of the Perfection of Wisdom to his heart. Take refuge, then, in one another. For each of you is the Church and each of you is the Community, and the refuge is a refuge of Love, a place where you can go and find the necessary sustaining of your soul, your body and your mind. So Hierarchy has come to the West and you are blessed. Hierarchy has come to open the door of the heart of the East. How wondrous it is that those whom we call can have a physical place to come to [where they may] find our radiation and our teachings. Wisdom is the flame that makes life bearable in samsara, in the veil of illusion where maya is the great teacher. So Wisdom is the sustaining grace. It is the bubbling fountain of joy, it is hope, it is exaltation, it is Light and Light’s dimension. The Ascended Masters teach that Gautama Buddha was the first disciple to respond to the flame of Sanat Kumara on Earth and that Maitreya was the second. Sanat Kumara came to Earth from Venus long ago in Earth’s darkest hour to keep the threefold flame of Life on behalf of her people, when the Cosmic Council had determined that no further opportunity should be given to humanity—so great was their departure from cosmic law and their desecration of Life. One hundred and forty-four thousand souls from Venus volunteered to come to Earth with Sanat Kumara to sup-port his mission. Four hundred who formed the avant-garde were sent on ahead to build the magnificent retreat of Shamballa on an island in the Gobi Sea (where the Gobi desert now is). Assuming the office of Lord of the World, Sanat Kumara resided in this physical retreat but he did not take on a physical body such as the bodies we wear today. Later it became expedient to its protection that Shamballa be withdrawn from the physical plane to the etheric octave. After this took place, Sanat Kumara embodied as none other than Dipankara, the Lamp-lighting Buddha. In Buddhist tradition, Dipankara walked the earth to save souls and prophesied that the ascetic Sumedha would become the future Buddha Gautama. <90>Dipankara (literally “kindler of lights”) is believed to have been the first of twenty-four Buddhas who preceded Gautama. He is portrayed together with Gautama and Maitreya as one of the Buddhas of “the three times”—past, present and future. Gautama was Dipankara’s student before his incarnation as Prince Siddhartha when he became the Buddha. He and Maitreya spent time between embodiments at Shamballa and received training there, both when it was physical and after it was removed to the etheric plane. There is a sphere of light within my own soul that represents the path of my chelaship under the Lord Sanat Kumara. Hand in hand Gautama and I would go through meadow and forests, climbing to the heights of the Himalayas—not in search but in surrender unto the Eternal Guru, the Everlasting Star, that Light whom we knew as the very Person of heartbeat. In a ceremony held at the Royal Teton Retreat <92> on January 1, 1956, Gautama succeeded Sanat Kumara in the office of Lord of the World and Maitreya succeeded Gautama in the office of Cosmic Christ and Planetary Buddha. Lord Maitreya passed the mantle of World Teacher to the candidates for that office, Jesus Christ and Kuthumi, who, as I have said, are Buddhas in their own right. When Sanat Kumara placed his mantle on Gautama Buddha as Lord of the World, he assumed the title of Regent Lord of the World. Sanat Kumara then returned to planet Venus and his twin flame, Lady Master Venus, who had held the flame on Venus during his absence. Since that time Sanat Kumara has come in several dictations to anchor his presence in our midst and has promised that he and Lady Master Venus would stay with Earth until the plan of God is fulfilled. Sanat Kumara revealed in these Pearls that Lord Maitreya is one of the four hierarchs of the Ruby Ray, who serve as initiators of the souls of the Lightbearers on the Path of the Ruby Ray. These initiations take the chelas of Divine Love on a course of soul-mastery on the ruby cross through the lessons of sacrifice, surrender, selflessness and service as they are charted on the 1/7 and 4/10 axes of the Cosmic Clock. As El Morya pointed out in his July 5, 1985 dictation quoted on page 46, the four Ruby Ray hierarchs occupy the offices of the Lion, the Calf (or the Ox), the Man and the Flying Eagle. Wearing the mantle of the Man, Jesus Christ initiates us in the virtue of surrender on the one o’clock line under the hierarchy of Aquarius. Wearing the mantle of the Lion, Lord Maitreya initiates us in the virtue of sacrifice on the seven o’clock line under the hierarchy of Leo. Wearing the mantle of the Calf, Gautama Buddha initiates us in the virtue of service on the four o’clock line under the hierarchy of Taurus. Wearing the mantle of the Flying Eagle, Sanat Kumara initiates us in the virtue of selflessness on the ten o’clock line under the hierarchy of Scorpio. In these same offices, the Ruby Ray hierarchs also teach soul-mastery in the four quadrants of the Cosmic Clock as they stand on the 12/6 and 3/9 axes, holding the balance of the cosmic cross of Power formed thereby as well as the threefold flame for each quadrant. Lord Maitreya as the Lion holds the flame of God-Power on the twelve o’clock line under the hierarchy of Capricorn, governing the etheric (fire) quadrant. Sanat Kumara as the Flying Eagle holds the flame of God-Harmony on the six o’clock line under the hierarchy of Cancer, governing the water quadrant of the emotions. Jesus as the Man holds the flame of God-Control on the three o’clock line under the hierarchy of Aries, governing the mental (air) quadrant. Gautama as the Calf holds the flame of God-Reality on the nine o’clock line under the hierarchy of Libra, governing the physical (earth) quadrant. The world is waiting for Maitreya and Maitreya’s co-workers and servants. And they are also waiting for my twin flame, whom they know not. Thus, out of the octaves of nirvana she has descended in a golden orb of Light. And you will see how this presence of my beloved will multiply my action in your behalf. Now see the great teams of conquerors. You have called to them. They are here! And if you see them not, watch how you will develop your spiritual senses by divorcing yourself from the world of drugs and sugar and marijuana and alcohol and nicotine. Beloved, I long to see you free, and we are determined! And the presence, then, in this golden sphere of [the] Causal Body of Light of my beloved does arc the presence of the Lady Master Venus in that Retreat of the Divine Mother unveiled over the Inner Retreat so that Camelot, in this city of the angels of the Christ and the Buddha [as well as of Mother Mary], shall have that ray and that Light of my divine counterpart. And you will know the truth of Maitreya. And you will receive the initiations individually from my heart daily if you but inscribe a separate letter to me this New Year’s Eve addressed to your Mighty I AM Presence and Holy Christ Self, to me and to my beloved twin flame. Then, beloved, you may apply to become my chela, my initiate. And watch well, for I AM determined to accept almost as many who call upon me, rather to give you the initiations and let you eliminate yourselves than to eliminate you without giving you a clean white page in 1986 to begin anew where you left off on Lemuria. “I and my Father are one” [is] the mantra of the protection of the Guru-Chela relationship that I gave to him, the Son of man. I and my Father are one! When you speak these words, the lineage of your [Ascended] Masters is with you, the Electronic Presence of Jesus is upon you, your own I AM Presence and Christ Self [are there], and I AM instantly there. For Jesus would have you call him “Brother” and me “Father.” And I agree, for it is a reminder that he is not so far above you but at your side, even though many of you have known him as Father. Thus, you see, the “I and my Father are one” mantra is actually a call. It is a call you may give in time of danger, chaos, confusion, accident or illness or any need, as long as you have the perception that the Call cannot and will not fail and as long as you have the understanding of who is Father. The Lord God Almighty is Father and his emissaries to whom he has given the mantle of his I AM Presence to teach mankind are Father. Thus the “I and my Father are one” mantra uses the I AM name to confirm the bond of our oneness. Let us give this mantra together. As God is in me and I am in God, so I declare, I and my Father are one. And lo, I have become the Father. And the Father has become the Son through the figure-eight flow that is the design of the plus/minus interchange of Alpha in the Guru and Omega in the Chela. Now I am the Father and Gautama is the Son. And as Gautama long ago passed the initiations of the Fatherhood of God, I bequeathed to him my flaming awareness of that Father. And lo, he declared, “I and my Father are one!” And he became the Father and the Father in the Son, the incarnate Word, the embodied Guru, the Lamb. Then Maitreya, the blessed, the beautiful, the bountiful Bodhisattva, beheld the vision of the Buddha, and the Buddha beyond the Buddha, as my own flaming presence revealed the parting of veil upon veil, each veil the opening of another door in heaven as his meditation parted the octaves of the first, the second, the third heaven, the fourth, the fifth, the sixth, and the seventh. Thus he bowed before the gracious Gautama as the Guru who was God because he unveiled to him the God of very gods. And lo, he declared, “I and my Father are one!” as he beheld the infinite succession of the Gurus who bore witness of worlds beyond worlds of the God manifestation. And Maitreya became the pivot point of the path of initiation unto every chela who would know the Guru, unto every soul of the hundred and forty and four thousand who would return to the Mystery School of the Garden of Eden. He was the embodied Guru, the Father/Son manifestation unto the twin flames of Adam and Eve and unto their children, my children, sent to earth to demonstrate the path of initiation. By the subtile serpent, Satan’s agent, the Path was set aside unto these twin flames and their offspring for six thousand cycles of life and death until the coming of the Lord Jesus Christ. Jesus then asked Martha for her confession of faith, whereupon she replied: “Yea, Lord: I believe that thou art the Christ, the Son of God, which should come into the world.” <104>Her witness to the Christ of Jesus as the Son of God whose coming had been prophesied was also her witness that Jesus was the incarnation of the Word I AM THAT I AM. Martha’s faith in her Lord has become the foundation of every Christian’s acceptance of Jesus as their Lord and Saviour whereby they have entered into the Guru-chela relationship with the Master. Heed my word, ye ministering servants. It is the hour of the resurrection flame. It is time for the resurrection! It is time for the raising up of the sacred fire! It is time that you use the mantra “I AM the Resurrection and the Life” and then continue with the affirmation of all things in your life that require filling in. I AM the Resurrection and the Life of God’s faith within me now! And I refuse to accept any alternative [to God’s faith manifest as] doubt and fear! I AM the Resurrection and the Life of my God-Victory now! Now made manifest in my hands and use today! In Buddhism Maitreya is considered to be in the family of the Dhyani Buddha Amoghasiddhi. Each of the Five Dhyani Buddhas is a parent of a group of Buddhist deities. As charted on the Cosmic Clock, Lord Maitreya is our initiator in the virtue of God-Victory on the eleven o’clock line under the hierarchy of Sagittarius. Amoghasiddhi embodies the Fifth Secret Ray and delivers our initiations on this ray from the eleven-thirty line. Amoghasiddhi’s mantra is Om Amoghasiddhi Ah. Amoghasiddhi’s mudra is the abhaya, or fearlessness, mudra, which is said to assure protection; and as I mentioned earlier, Maitreya is also portrayed using this mudra. As there is no fear in love, and perfect love casts out all fear, <106> so true love and true fearlessness are one and the same divine attribute. For the vacuum of fear created by fearlessness flame is instantaneously filled by the all-power of God’s love. Thus you will remember the teaching that Maitreya’s quality of loving-kindness prevents evil and establishes peace and that those who are filled with this virtue are protected from all harm. Therefore when you form the abhaya mudra be sure to visualize fearlessness flame as Divine Love in action blazing forth from your upraised palm. You form this mudra by raising your right arm to shoulder height with the palm turned outward and the fingers extended upward. Sometimes the fingers are curved. Jesus told us to use the abhaya mudra when we call forth the true and righteous judgments of the Lord—which are always God’s love in action. Let those who adore God, then, through the fervor of fiery, fohatic prayer—let those who adore him in the joyousness and the boundlessness of his divine decree that they deliver as the Word of the Lord into the consciousness of relative good and evil—let those who go to the mount Sion to adore him in the meditation of their hearts’ light upon the light of God’s heart—therefore learn to seal their chakras from all vibrations less than the Christ Light registering in the Matter spheres. When, therefore, your attention must be directed into a multitude of matters demanding your watchful eye and skill of the hand, and by and by you feel the encroach­ment of random particles of effluvia pressing against your wall of Light, remember, even the policeman directing traffic makes use of the ancient mudra which universally communicates the cosmic vibration STOP! I AM the first and the last, the living Guru Maitreya. I am present with you and in you unto the universal idiom of the word of Victory. I AM Maitreya, Ma. I bless you by the sacrament of my life, by the sacrament of my perpetual adoration of God. Lo, I AM Alpha and Omega. I AM present with you alway. Now speak my name silently in your heart: Maitreya. And in my name wrap the burden of your soul, the problem of the day. Wrap it carefully in my name, for I stand now before you in the Great Silence ready to receive that package addressed to me. I AM thy healing Light. I AM the Lover of thy soul.
. Come unto me all ye who are weary and heavy laden. I will give you rest. I AM the all-consuming Light. The all-consuming Light is my yoke. Therefore take my yoke upon you and learn of me. I will demonstrate to you the alchemy whereby thy burden shall be Light <108> and thy Light shall be a flaming sword and thy sword shall be for the deliverance of the nations. By the flame of Saint Germain, Jesus Christ, and your own dear name written in heaven, I declare unto you, the Victory Flame is come! In my left hand I take the package addressed to me from each one of you now. And in my right hand I make my vow. And I thrust Victory’s torch and I say: Here, carry the torch of the fire of Victory and I will carry the burden of your day. This is my promise. May you take it and incorporate it into your morning ritual. So greet the dawn and make your little package, whether small or great. Seal it with my name. My angels will take that package and give to you the torch of Victory for your day, each and every day until your ascension in the Light. Lo, the ascension draweth nigh. Hail, Maitreya! Hail, Victory! Hail, Flame of God! Will you not, then, first and foremost take up the study of all of my dictations [which I have released] even through these two disciples, your Messengers? Will you not search them to discover the keys of this age that is known in some quarters as “the Age of Maitreya”? Then will you not see that all others [of the spiritual hierarchy] who have released by the Holy Spirit of the Great White Brotherhood the vast Teaching set forth have also been my Messengers—the Ascended Masters, the angelic hosts? In this volume of Pearls of Wisdom you will find a series of dictations of Lord Maitreya delivered through the Messenger Mark L. Prophet and me entitled “A Study in Christhood by the Great Initiator.” This series also includes teachings given under the banners of Maitreya and the World Mother by many Ascended Masters for the perfecting of your soul on the path of personal Christhood becoming the Bodhisattva. I bring to you, then, the sense of yourself as an extension of myself (who am an extension of Gautama, Sanat Kumara) in order that your heart, beloved ones, may become as a fiery furnace, sacred and intense, in which you store Light—far more Light than that stored by those not on the Path—and become thereby truly a transformer of worlds. And by that heart, when you stand in the presence of the children of the Mother, they can no longer be the same. They must be different. They must know joy. Such is my presence in the Messenger. And all acquisitions begin with the attainment of the fire of the heart—the balanced threefold flame expanding, multiplying and intensifying its outreach daily. Thus we come full circle to the teachings we began with and the keynote of Lord Maitreya, the development of the heart in loving-kindness. Know me, then, in kindness first expressed by you. Then the return current of that kindness expressed by another will reveal to you one of my million smiles through the friend, through the kind ones on earth, the wise ones who know that true kindness is found in the act of one who has cared enough to earn the key to open the door to successive chambers of my retreat. Come and find me, beloved. I would woo you to the courts of Maitreya. Come and find me, beloved. I shall not tell where I hold court to deliver my mystery teachings in the etheric octave, for I desire those who have the magnet of my heart to find me as one would find a treasure without a map—only lodestone attracted to lodestone. But I place in your heart, in this hour together, fire of my fire. I dip into this fire, beloved—a gold and pink and white fire—I dip into it, and in the multiplicity of my Self and Presence I place [it] into an urn (which by your leave I have already placed upon the altar of your heart)—a beautiful gold and pink and white fire. These colors merging, beloved, produce many hues. To manifest round my form. My four lower bodies adorn! Hear our call and answer by Love’s ascending ray. Raise my four lower bodies today! I AM fully charged with Victory’s mead. El Morya says that when you seek and find the secret chamber of the heart of your own beloved Holy Christ Self and can come and go there at will, you will seek and find Maitreya’s Secret Abode. We access the Light of our God by our devotions, our service and our exercise of the science of the spoken Word through I AM affirmations, mantras, prayers and decrees. This Light has also been individualized and qualified with certain virtues, powers and attainments by the saints and Ascended Masters through their devotions, their service and their exercise of the science of the spoken Word. This their collective offering to devotees on earth is accessible to those who call to these heavenly friends by name, imploring their intercession through the Mighty I AM Presence. Om Ah Maitreyanathaya Hum Phat Svaha. Maitreyanathaya is “he who has Maitreya as a protector” or “Maitreya, the protector.” Natha means “Lord,” “protector,” “patron,” “possessor,” “owner” and is often used in compounds with names of gods and men. Hum is one of the seed syllables for manifestation. Phat is the release of fohat, which is the concentrated energy of the sacred fire held in the chakras by the adepts. Svaha is the sealing of the mantra. Om Ah Maitreyanathaya Hum Phat Svaha. Maim is the seed syllable for Maitreya. The essence of a cosmic being, chakra or principle is said to be concentrated in a bija mantra, or seed syllable. Aim is the seed syllable of Sarasvati, who is the representative of the Divine Mother as the consort, or Shakti, of Brahma, the Father principle in the Hindu Trinity of Brahma, Vishnu and Shiva. As I have mentioned, one of the roots of Maitreya’s name is matr, “mother.” Thus Aim becomes the seed syllable for Maitreya when we add the letter M. So the mantra using Maitreya’s seed syllable is Om Maitreya Maim. Om Maitreya Maim. Throughout these notes PoW is the abbreviation for Pearls of Wisdom. 1. A stupa (literally “hair knot”) was originally a monument erected over the relics of Gautama Buddha and other great saints. Today stupas are highly symbolic structures that are the focus of devotion in Buddhist monasteries or temples. Stupas may contain sacred texts and other sacred objects. One Buddhist text recounts that Gautama Buddha told a disciple that stupas should be constructed not only as monuments to the dead but as monuments to the living—to a Buddha and “a true hearer” of a Buddha. Thus the stupa is more than just a memorial for the worship of Buddhas or saints; it is a supreme symbol of the path of the attainment of enlightenment, the goal of every Buddhist. The component parts of the stupa symbolize the qualities or disciplines that produce the awakened state of mind. Eight different types of stupas commemorate the eight major events in the life of Gautama Buddha and stupas have been erected at sites that played an important role in Gautama’s life. bhumi) of the spiritual development of a bodhisattva. The middle part or ‘body’ of the chöten symbolizes the awakened mind (bodhicitta) and in certain cases contains the image of a deity. Above this middle part rise thirteen umbrella shapes of different sizes; they represent various methods of propagating the Buddhist teaching (dharma). On top of these umbrella shapes is a five-petaled lotus, symbol of the properties of the five Buddha families (buddhakula) [each headed by one of the Five Dhyani Buddhas]. The pinnacle of the stupa is composed of a sun disk resting on a crescent moon, which symbolizes the cosmic grandeur of the teaching. [Above this, at the very top of the structure, there is a flaming drop]” (The Encyclopedia of Eastern Philosophy and Religion [Boston: Shambhala Publications, 1989], p. 340). The interior ground plans of stupas of the Vajrayana school of Buddhism are designed to represent the mandala of the Five Dhyani Buddhas. The different levels of the chorten also correspond to the five elements, which are symbolized by a specific bija mantra, color and form (shape). Lama Govinda writes of the symbology of the chorten: “The cubic forms of the lower storeys correspond to the element ‘Earth’, the round central part to the element ‘Water’, the conical (gilt) upper-structure to the element ‘Fire’, the umbrella above it to the element ‘Air’. The flaming drop of the element ‘Ether’ rests on the vessel with the ‘Elixir of Life’, which crowns the honorific umbrella” (Foundations of Tibetan Mysticism [1960; reprint, New York: Samuel Weiser, 1969], pp. 185-86). The stupa is also said to represent the temple of man or the Body of the Buddha. One Pali text says, “The stupa is the Buddha and the Buddha is the stupa.” Govinda explains that in some Nepalese stupas, for instance, the structure is decorated near the top with painted eyes to suggest “a human figure in the posture of meditation hidden in the stupa, the crossed legs in the base, the body up to the shoulders in the hemisphere, the head in the harmika [kiosk or altar-like structure at the top]. 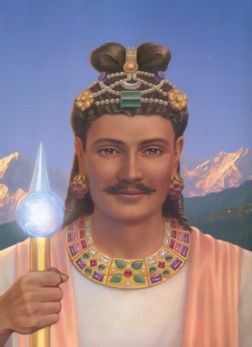 This also corresponds to the psycho-physiological doctrine of the centers of psychic force [chakras] which are located one above the other in the human body and through which consciousness develops in ascending order....The [crown chakra] is symbolized by a dome-shaped or flame-like protuberance on the head of the Buddha, and by the cone-shaped Tree of Enlightenment which forms the spire of the stupa” (Psycho-cosmic Symbolism of the Buddhist Stupa [Berkeley: Dharma Publishing, 1976], pp. 84-85). “In innumerable texts the Dharma is equated with light: the Buddha’s Awakening is an Illumination, and his preaching of the Dharma is an irradiation of the worlds. The stupa as Dharma is thus a source of light; it is a Beacon of the Law, and in many places it has been a common custom to light up the stupa with a profusion of lamps....The stupa propagates the doctrine; it shines with the radiance of the Dharma, illuminating the four quarters. The building of a stupa is a renewal of the preaching of the Dharma. According to a Tibetan text, the stupa is built to allow all creatures to see the Buddha, to hear the Law spoken once again, and to reverence the Community (sangha) which has received the Law and faithfully transmitted its teachings” (The Symbolism of the Stupa [Ithaca, N.Y.: Cornell Southeast Asia Program, 1985], pp. 366, 370-71). 2. Nicholas Roerich, Altai-Himalaya: A Travel Diary (Brookfield, Conn.: Arun Press, 1929), p. 103. 3. Christine M. E. Guth, “The Pensive Prince of Chuguji: Maitreya Cult and Image in Seventh-Century Japan,” in Maitreya, the Future Buddha, ed. Alan Sponberg and Helen Hardacre (New York: Cambridge University Press, 1988), pp. 191, 195. 4. Har Dayal, The Bodhisattva Doctrine in Buddhist Sanskrit Literature (1932; reprint, New York: Samuel Weiser, 1978), pp. 227, 228. 5. I. B. Horner, trans., Milinda’s Questions, vol. 1 (London: Luzac and Company, 1963), pp. 286, 287, 289. 6. Maha Sthavira Sangharakshita, The Three Jewels: An Introduction to Buddhism (1967; reprint, London: Windhorse Publications, 1977), pp. 170-71. 7. Saint Germain, April 16, 1988, 1988 PoW, p. 404. 8. Kuan Yin, July 1, 1988, 1988 PoW, p. 475. 9. Dayal, Bodhisattva Doctrine in Buddhist Sanskrit Literature, pp. 216-17. 10. Helena Roerich, Foundations of Buddhism (New York: Agni Yoga Society, 1971), pp. 141-42. 11. Bhikshu Sangharakshita, A Survey of Buddhism, 5th ed. (Boulder, Co.: Shambhala, 1980), p. 434. 12. Dayal, Bodhisattva Doctrine in Buddhist Sanskrit Literature, pp. 209-10. 15. “One picture is worth more than ten thousand words,” a Chinese proverb. 16. Lord Maitreya, June 30, 1988, 1988 PoW, pp. 444, 445. 17. E. Zürcher, “‘Prince Moonlight’: Messianism and Eschatology in Early Medieval Chinese Buddhism,” T’oung Pao: Revue inter­nationale de Sinologie 68 (1982): 14, 39, 40. 18. Susan Naquin, “The Transmission of White Lotus Sectarianism in Late Imperial China,” in Popular Culture in Late Imperial China, ed. David Johnson, Andrew J. Nathan and Evelyn S. Rawski (Berkeley: University of California Press, 1985), pp. 257, 265. 19. samsara [Sanskrit, literally wandering through, journeying]: passing through a succession of states; the indefinitely repeated cycles of birth, misery, and death caused by karma; corporeal existence; worldly illusion; the universe of manifestation and phenomena as distinguished from the real existence which lies behind it. 20. Daniel L. Overmyer, “Folk-Buddhist Religion: Creation and Eschatology in Medieval China,” History of Religions 12 (August 1972):60. Psalm 82 gives a message that the Buddha might have delivered to the children of the Mother in the Dragon Flower Assembly. 21. Hue-Tam Ho Tai, “Perfect World and Perfect Time: Maitreya in Vietnam,” in Maitreya, the Future Buddha, p. 165. 22. Overmyer, “Folk-Buddhist Religion,” p. 61. 23. Susan Naquin, Millenarian Rebellion in China: The Eight Trigrams Uprising of 1813 (New Haven: Yale University Press, 1976), p. 10. 24. Overmyer, “Folk-Buddhist Religion,” p. 57. 25. Daniel L. Overmyer, “Messenger, Savior, and Revolutionary: Maitreya in Chinese Popular Religious Literature of the Sixteenth and Seventeenth Centuries,” in Maitreya, the Future Buddha, p. 124. 28. You can see how the worldwide practice of abortion makes it even more difficult for the soul to find a body once she loses it in the transition called death. And you can see the mounting world karma of abortion—a karma not only for the abortion of a body but for the abortion of the divine plan of a soul; a karma for the abortion of entire karmic groups of souls who cannot complete their mission because part or all of their unit didn’t make it into embodiment. This karma is upon the entire race and it is the karma of spiritual as well as physical infertility. So with the compounding of karma, as cause begets effect which begets new causes, it is becoming more and more difficult indeed to get a new body to balance old karma. People seem oblivious to the effect of the absence of as many as 960 million souls who have been aborted worldwide since Roe v. Wade in 1973. At least 22 million abortions have been performed in the United States alone since 1973, which is equal to 8.9 percent of the current U.S. population. An estimated 40 million to 60 million abortions each year have been performed worldwide since 1973, making a total of between 640 million and 960 million. These “missing persons” will not take their place as adults in the world scheme in the final decade of the twentieth century nor will those who might have been their eventual offspring. The absence of these lifestreams in embodiment in this hour has compromised the divine plan for earth and her evolutions, and the karma created by it cannot even be calculated. We are the losers and this karma affects us all. 29. Overmyer, “Messenger, Savior, and Revolutionary,” p. 119. 31. Garma C. C. Chang, ed., A Treasury of Mahayana Sutras: Selections from the Maharatnakuta Sutra (University Park, Pa.: Penn­sylvania State University Press, 1983), pp. 409-10. 32. Lord Maitreya, March 24, 1985, 1985 PoW, pp. 617, 618. 33. Lord Maitreya, April 19, 1981, 1981 PoW, p. 278. 34. James M. Robinson, ed., The Nag Hammadi Library in English (San Francisco: Harper and Row, 1977), p. 331. 35. Kurt Rudolph, Gnosis: The Nature and History of Gnosticism (San Francisco: Harper and Row, 1987), p. 131. 36. John 10:14, 27; 17:11, 14. 37. Robinson, Nag Hammadi Library, p. 123. 39. G. R. S. Mead, trans., “The Hymn of the Soul,” in G. A. Gaskell, Gnostic Scriptures Interpreted (London: C. W. Daniel Company, 1927), pp. 49, 57-58. 40. Himalaya, October 4, 1987, 1987 PoW, pp. 502-3. 41. Rudolph, Gnosis, p. 122. 43. Sanat Kumara (from the Sanskrit sanat, “from of old,” “always,” “ever” and kumara, “always a youth”) is revered in Hinduism as one of the four or seven sons of Brahma; they are portrayed as youths who have remained ever pure. Sanat Kumara is said to be the oldest of the progenitors of mankind; in the Mahabharata he is called the “eldest born of Brahman.” In some accounts he is considered to be the son of Shiva. In the Chandogya Upanishad Sanat Kumara is the teacher of the sage Narada, who learns from him that the highest truth can be attained only through true Self-knowledge. Sanat Kumara also takes on the role of the god of war and commander-in-chief of the divine army of the gods in his manifestation as Karttikeya or Skanda. He is often represented holding a spear and riding on a peacock and is sometimes shown with twelve arms holding weapons. He is said to have been reared by the six Pleiades, from which the name Karttikeya (“Son of the Pleiades”) is derived. Some works also acclaim Karttikeya as the god of wisdom and learning. 46. Matt. 11:14; 17:12, 13; Mark 9:13. 48. Matt. 10:5, 6; 15:24; 18:11-14. 49. Matt. 11:11; Luke 7:28. 52. Lama Anagarika Govinda, “Origins of the Bodhisattva Ideal,” Stepping-Stones 2 (January 1952): 244, quoted in Sangharakshita, A Survey of Buddhism, p. 395. 53. Stanley Frye, trans., The Sutra of the Wise and the Foolish; or, The Ocean of Narratives (Dharamsala, India: Library of Tibetan Works and Archives, 1981), p. 14. 54. Padmanabh S. Jaini, “Stages in the Bodhisattva Career of the Tathagata Maitreya,” in Maitreya, the Future Buddha, p. 59. 55. H. Saddhatissa, trans., The Birth-Stories of the Ten Bodhisattas and the Dasabodhisattuppattikatha (London: Pali Text Society, 1975), pp. 58, 60. 56. Deut. 10:17; II Sam. 14:14; Acts 10:34; Rom. 2:11; Eph. 6:9; Col. 3:25; I Pet. 1:17. 57. Alpha and Omega, July 3, 1988, 1988 PoW, p. 531. 58. The dweller-on-the-threshold is a term sometimes used to designate the anti-self, the not-self, the synthetic self, the antithesis of the Real Self, the conglomerate of the self-created ego, ill conceived through the inordinate use of the gift of free will, consisting of the carnal mind and a constellation of misqualified energies, forcefields, focuses, animal magnetism comprising the subconscious mind. See Elizabeth Clare Prophet, November 26, 1987, “The Lost Teachings of Jesus: On the Enemy Within,” on two 90-min. audiocassettes, $13.00 (add $.95 for postage), A87097; 1983 PoW, pp. 50, 383-91, 429-54; 1985 PoW, pp. 84, 85-93, 97, 350 n. 10; 1986 PoW, pp. 199, 203, 210-12; glossary in Saint Germain On Alchemy, pp. 395-96. 59. Rom. 7:23; James 4:1. 60. John 9:4, 5; 12:35, 36. 61. Kenneth K. S. Ch’en, Buddhism in China: A Historical Survey (Princeton, N.J.: Princeton University Press, 1964), pp. 405-6, 407-8. 62. M. Conrad Hyers, Zen and the Comic Spirit (London: Rider and Company, 1974), pp. 46, 47-48. 63. Roerich, Foundations of Buddhism, p. 146. 65. Letters of Helena Roerich, 1929-1938, vol. 1 (New York: Agni Yoga Society, 1954), p. 425. 66. Letters of Helena Roerich, 1935-1939, vol. 2 (New York: Agni Yoga Society, 1967), p. 62. 67. [Helena Roerich], Woman (New York: Agni Yoga Society, 1958), p. 28. 68. The mountain known in the local area as Deaf Jim Knob was renamed “Maitreya Mountain” by the Messenger. It is located on the Royal Teton Ranch and overlooks the Heart of the Inner Retreat from the southeast. 69. Gautama Buddha, November 8, 1981, 1981 PoW, pp. 499-500. 70. See p. 89 following p. 402. 71. See Elizabeth Clare Prophet, Introduction I, “Lord Maitreya: The Coming Buddha Who Has Come,” 1984 PoW, Book I, pp. 1-3. 72. Justinius, April 6, 1985, 1985 PoW, p. 285. 73. Jesus is called Issa in both the written chronicles and oral traditions of the East, where he spent his 17 to 18 “lost years,” from age 13 to 29, not accounted for in the Bible. See Elizabeth Clare Prophet, The Lost Years of Jesus. 75. See pp. 85, 86, 87 following p. 402. 76. On January 1, 1986, Gautama Buddha announced that he and the Lords of Karma had granted the petition of the Lords of the Seven Rays to open universities of the Spirit—courses of instruction given by the Seven Chohans and the Maha Chohan at their etheric retreats for tens of thousands of students who are pursuing the path of self-mastery on the seven rays. See 1988 PoW, pp. 287 n. 5, 544 n. 11, chart p. 438. 77. The Maha Chohan, May 15, 1988, 1988 PoW, pp. 435-36. 78. The terms Lion, Calf (or Ox), Man and Flying Eagle are used by Ezekiel and John the Revelator. The same office in hierarchy referred to by Ezekiel as “Ox” (Ezek. 1:10) is denoted by John as “Calf” (Rev. 4:7). See Ezek. 1:5-10; Rev. 4:6-8; Sanat Kumara, 1979 PoW, Book I, pp. 91-128, 201-8, diagrams pp. 136, 142, 186, 274-75. 79. El Morya, July 5, 1985, 1985 PoW, pp. 424-25. 80. Sanat Kumara, Gautama Buddha, Lord Maitreya and Jesus Christ are the initiators on the Path of the Ruby Ray positioned at the south, west, north and east gates of the New Jerusalem. See Sanat Kumara, 1979 PoW, Book I, pp. 165-71. 81. Gautama Buddha, April 18, 1981, 1981 PoW, pp. 225, 226, 227. 82. Archangel Jophiel, January 1, 1989, 1989 PoW, p. 37. 83. Heros and Amora, October 11, 1988, 1988 PoW, p. 635. 84. El Morya, June 30, 1988, 1988 PoW, p. 450. 85. Matt. 24:31; Mark 13:27; Saint Germain, July 4, 1981, 1981 PoW, pp. 360-61. 86. Gautama Buddha, May 13, 1987, 1987 PoW, p. 249. 87. Sangharakshita, The Three Jewels, p. 150. 88. Vajrapani (Sanskrit, literally “thunderbolt-bearer”) is the Dhyani Bodhisattva who belongs to what is known as the “vajra family,” headed by the Dhyani Buddha Akshobhya. According to Buddhist teachings, Vajrapani is the Bodhisattva of energy and power. In Tibetan art he is dark blue in color and is portrayed in both a benign and a wrathful form. In his peaceful aspect he holds a lotus flower; in his wrathful aspect he dispels demons and guards the Dharma by trampling the enemies of religion. 89. Sangharakshita, The Bodhisattva: Evolution and Self-Transcendence, 2d ed. (Glasgow: Windhorse Publications, 1986), pp. 21, 22-23. 90. See Gautama Buddha, Quietly Comes the Buddha, pp. 18-39; 1975 PoW, pp. 97-106. 91. Lord Maitreya, December 4, 1980, 1980 PoW, p. 359. 92. The Royal Teton Retreat, congruent with the Grand Teton near Jackson Hole, Wyoming, is the principal retreat of the Great White Brotherhood on the North American continent. See 1988 PoW, p. 154 n. 6. 93. Sanat Kumara, December 15, 1985, 1986 PoW, pp. 70-71. 96. Sanat Kumara, 1979 PoW, Book I, p. 165. 97. Lord Maitreya, January 1, 1986, 1986 PoW, p. 195. 98. Lord Maitreya, December 31, 1985, 1986 PoW, pp. 161-62. 99. See p. 88 following p. 402. 100. John 12:44, 45; 14:10, 11. 101. Archangel Gabriel, Mysteries of the Holy Grail, p. 262. 102. Sanat Kumara, 1979 PoW, Book I, pp. 77-78. 105. Lord Maitreya, July 14, 1985, 1985 PoW, p. 497. 107. Sanat Kumara, 1979 PoW, Book I, pp. 341-42. 110. Lord Maitreya, June 30, 1988, 1988 PoW, p. 444. 111. Lord Maitreya, March 24, 1985, 1985 PoW, pp. 619, 620-21, 622-23. 112. [Helena Roerich], Heart (New York: Agni Yoga Society, 1975), p. 50. 113. Lord Maitreya, February 14, 1988, 1988 PoW, p. 172. 114. Lord Maitreya, June 30, 1988, 1988 PoW, pp. 444-45.